Bry-Air Twin Loader ensures that the material is always available at both the Primary and Secondary receivers. These Loaders are designed for conveying of un-dried and dried material at both points. When the power is switched On i.e. when start key is pressed, the vacuum blower starts and the solenoid valve of primary receiver get energized starting the primary loadings. After completion of primary loading, the solenoid valve of secondary receiver get energized and secondary loading starts. At the same time primary receiver belly dumps material into hopper and a signal goes to the controller for next cycle. After completion of the both cycles, primary as well as secondary, the controller checks at which station material is required. If primary loader doesn’t need more material, the controller will switchover the loading to secondary loader and vise-versa. If both station do not require material, after a set delay time vacuum blower stops. Whenever the material is required by any station, the blower starts again and work as per the above sequence. Flapper & Flapper Type Receiver – When both the primary as well as secondary receivers are mounted on the Hoppers for conveying of un-dried material to two drying hoppers. 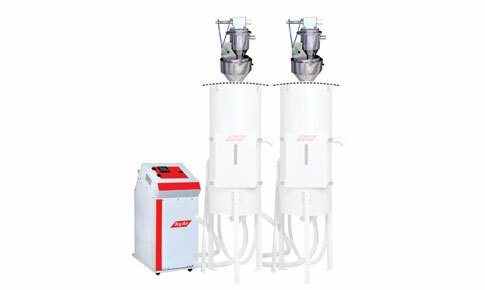 JIT (Just in Time) & JIT (Just in Time) TYPE RECEIVER – When both the primary as well as secondary receivers are mounted directly on the throat of the machine and for conveying dried material.